For whitetail deer hunters, there are few opportunities that present a better catch than Alabama deer hunting. In much of the state, there is hunt property managed for big bucks, which are every hunters prize, and the ratio of bucks to does is increasing by the season. In Alabama a hunt can involve bow hunting or gun hunting, so choose your preference. For the new hunter, there are many deer farms and preserves where a better deer hunting experience is guaranteed. Most lodges and farms specialize in whitetail deer, the most common species found in the south, and depending on which preserve you go to, you’ll find around 5,000 acres of hunting property where the deer are plentiful. In the last few years, the ratio of large bucks to does has increased. While the average results of does to bucks in the 2000-2001 season was reported to be three to one, the 2002-2003 season was down to 2.2 to one on preserves. Some of these farms actually offer winter classes to train you for deer in the wooded areas. In order to assure large bucks with well developed antlers and to make sure that herds are of considerable size, many deer farms feed their animals much more than just the natural vegetation. The fields of such farms are kept full of iron clay peas, grain sorghum, and other protein sources that assist in the growth of deer. Depending also on your goal as a hunter partaking of Alabama deer hunting, many such preserves are divided for various usage. Some have open tracts of land for bagging does and small bucks, with designated areas where you can search for your trophy buck. Most areas allow you to choose between guided hunts and self-assessed experiences. One thing to keep in mind is that deer hunting in Alabama is seasonal, and you cannot just enter the woods and seek out your trophy deer at any time. For archery (bow hunting), deer season begins in mid-October, while gun deer hunting season is delayed until late November. Exact dates are determined by year, and you should check with the Alabama Department of Wildlife to find exact season opening dates. 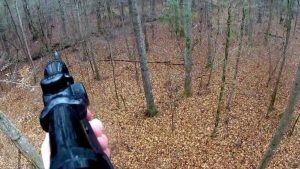 Alabama deer hunting for many is a way of life. For decades, avid hunters of whitetail deer have either lived in or flocked to Alabama for one of the most productive seasons anywhere in the country. Because of the minimal hunting restrictions and the many opportunities available, deer hunting is a profitable business for many in the state of Alabama. Duck Hunting Tips: Planning to Go Hunting?